The Portland Press-Herald just published an editorial: “Ranked-choice voting is right for Maine,” which states: “we support Question 5, a proposal to introduce ranked-choice voting in primaries and general elections for U.S. senator, U.S. representative, governor and members of the Maine Legislature. Communications director for FairVote, Whittaker said today: “FairVote applauds the tireless work of thousands of grassroots supporters and volunteers to bring ranked choice voting to Maine. Question 5 gives voters a stronger voice and ensures that the will of the people is heard in Maine. In our current system, the way we choose our leaders is failing. As a nonpartisan group, FairVote advocates for proven solutions to make elections better. Voters should have the freedom to vote for the candidate they like the best without fear that their vote will help the candidate they like the least. Studies show that campaigns are less negative in cities that use ranked choice voting. Rewarding candidates who seek to earn every voter’s support is a win for the people of Maine and American democracy as a whole. 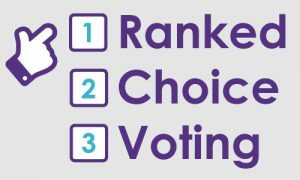 Ranked choice voting is a nonpartisan reform supported by Republicans, Democrats, and independents. We all recognize the need to make our country a better place for future generations. It begins with how we elect and hold our leaders accountable.